Our featured staff member for the month of December is Brenna Arnold. 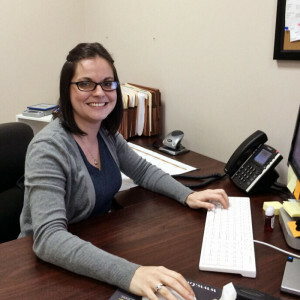 Brenna works primarily out of our Xenia office, and serves as the chief paralegal for Jay Adams. Brenna joined CiceroAdams in March of 2015 in the position of Legal Secretary before being promoted to her current position. Brenna says “[she has] always been fascinated by the law”. One of the things she likes about her job is that “no two cases are the same”, and she enjoys “helping people”. She gets her strong work ethic and professionalism from emulating her mother, a strong role-model in her life. Brenna is our resident coffee aficionado, and frequently fills the Xenia office with the aroma of a fresh brew. She makes it a point to share that her morning ‘cuppa joe’ is an imperative! Brenna is originally from the Dayton area, and attended Fortis College prior to her joining our firm. When not working, she loves spending time with her family, and has recently started the activity of geocaching with her family throughout the Dayton region.